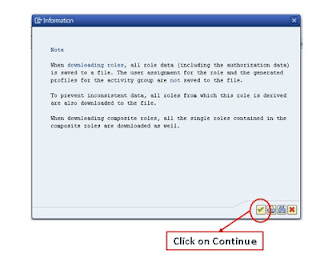 What is download and upload roles in SAP? 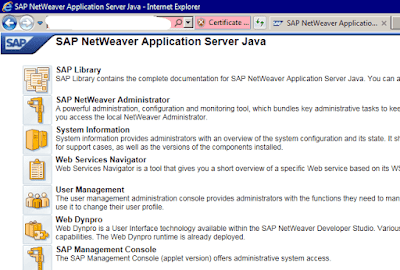 How to download roles and upload in SAP? Difference between role download and upload? 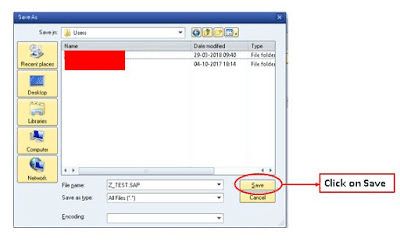 How to download mass role and upload in SAP? 2- Role download and upload. When downloading roles, all role data ( including the authorization data) is saved to file. The User assignment and generated profiles for the roles are not not saved to the files. When we are downloading composite roles, all the single roles contained in the composite roles, will be downloaded. To prevent role inconsistency data, all role from which the role is derived (master) is also downloaded to the file. 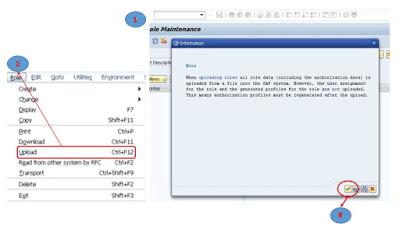 Login to ABAP System and execute PFCG transaction. 1- Specify the role name in PFCG transaction. 2- Go to Role Menu -> Download. A popup window will appear, having information about downloading roles. Click on continue. 3- Specify the directory to save the role. Role has been downloaded and save in directory. When uploading roles, all role data (including the authorization data) is uploaded from a file to SAP System. We need to generate profiles for all the uploaded role. 3- Select the download role and choose Upload. Now the Role have been uploaded in target system.